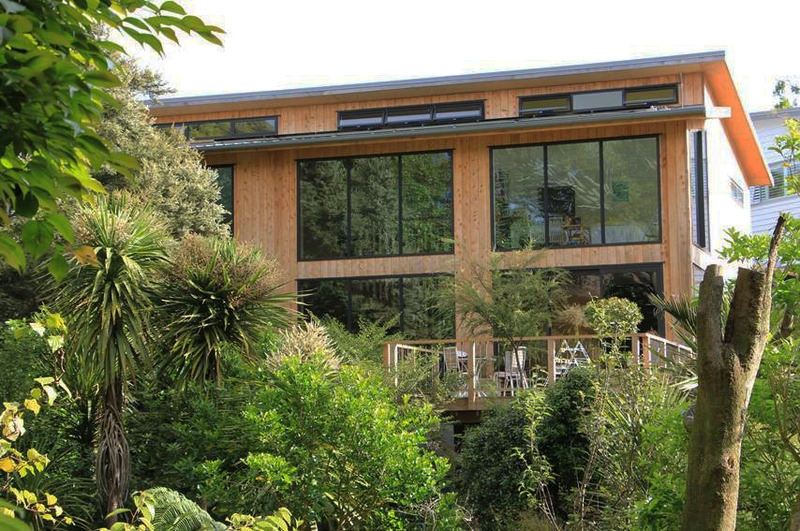 The temperate climate of Auckland provides an ideal opportunity for a house that will passively heat and cool with seasonal changes. 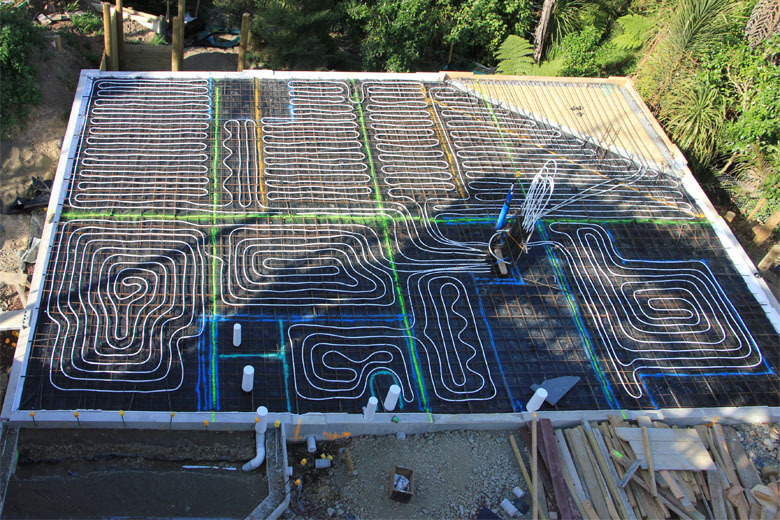 The concrete slab thermal mass is used absorb and transfer solar heat. Sufficient mass is needed as a reservoir but not too much mass as that would take too much energy (or time) to heat up. The Loxone server operates values in a manifold to move heat from warm to cooler floor zones via a low pressure water pump. Zone 1 is the northwestern corner and is free from tree shading. This single zone provides about 80% of the heating. The current setting is for heat transfer to occur to other zones automatically when there is a 2 degree temperature difference between any of the zones. The 18 solar PV panels on the roof produce a peak of 4.2 kW. 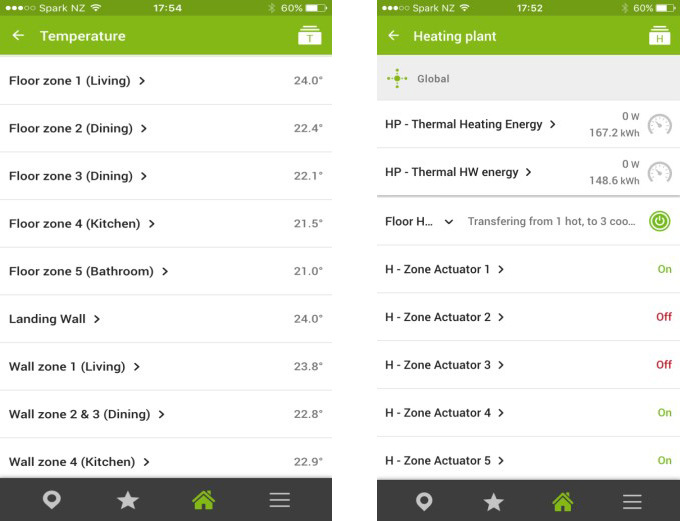 The system is currently set so that when 2kW is being generated, the heat pump will firstly heat the hot water cylinder. During winter months the next call is to boost the underfloor temperature (if needed). Any surplus generation not being utilised to run the house is exported to the grid. Since moving into the house in July 2015, the occupant’s experience so far is that most underfloor heating is provided by the sun, and seldom was additional heat from the heatpump needed. After 7 months of operation it looks likely that imported electricity will closely match exported electricity over a full 12 months. The topography of the site protects the house from southerly and westerly winds so there are few cross breezes to ventilate. The design relies on hot air rising to ventilate which often generates its own cool breeze. If needed the slab can be cooled by up to 3 degrees. To keep costs down, often underfloor water pipes are left out. The owner’s experience has been that the underfloor water piping is a critical component for efficient heating and cooling and so would not consider leaving this out of any design. In summary, any new house in Auckland should be able to have at least 80% of heating and cooling requirements covered passively by the design. This house demonstrates this ability.